Replace those worn out trampoline springs with the new Skywalker 9' x 15' Rectangular Trampoline STRC915.2 Replacement Springs, 16 count, to bring the bounce back to your tired old trampoline. Constructed of high quality rust-free galvanized steel, for years of high jumping use. 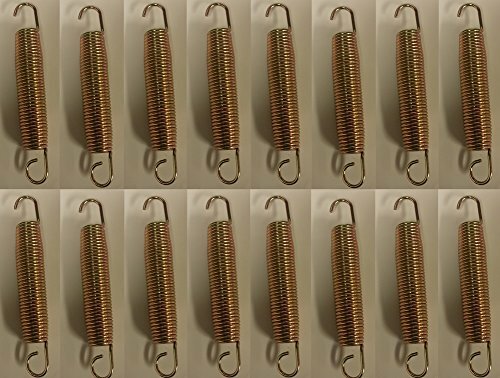 Be sure to measure your old springs to make sure that these are the correct replacement springs by measuring the entire length from hook-to-hook. Product Details: 7.5" Large Gold Springs - 1.25" diameter. 16 Count. SPRINGS ONLY. Fits: Skywalker 9' x 15' Rectangular Trampoline STRC915.2.